After reading about infant safe sleep practices, many parents are concerned about the winter months and how they can keep their baby warm without using blankets or dressing their babies in layers. Putting multiple layers on your child may seem like a good idea at first, but ultimately can lead to devastating consequences. Piling on the layers, can lead to overheating your child which is a contributing factor to infant sleep related deaths. In this section we have detailed how to avoid overheating your child and the best way to keep your child warm during those cold nights. Why is excess heat so dangerous to babies? You may have heard of instances where babies or small children have died after being left in hot cars in the summertime, this can happen to infants under any circumstances if they are allowed to become excessively hot, even in the wintertime. Our normal body temperature ranges from 98 to 100 degrees. It is within this range that our body is designed to work the best and with the greatest efficiency. If the body’s temperature is significantly higher than this for an extended period of time, there can be damage to all of the body’s vital organs, tissues, and cells which can result in injury or even death. What are signs of overheating? If you or I were overdressed for an outdoor or indoor temperature, we would remove excess articles of clothing, move to a cooler location, or drink some water. A baby, obviously, cannot do those things if they are too hot. What they can do to show you that they are hot and uncomfortable, is to become red in the face (and elsewhere) as the blood vessels in the skin dilate and try to give off excess body heat through loss of water from the skin (sweating). They may also begin to breathe faster and deeper. However, it is important to remember that not all infants are capable of sweating. Some infants under 2 months of age or preterm infants may not have developed their sweat glands adequately enough to perform this function. How do you avoid overheating a baby? Make sure your baby is dressed appropriately for their environment and does not have too many layers on. According to the American Academy of Pediatrics (2016), an infant should not wear more than 1 layer more than what an adult would need to be comfortable in that same environment. We have all heard the saying, “you lose most of your body heat through your head,” however; to keep your baby warm, it is best not to take this advice during sleep. The American Academy of Pediatrics recommends that parents avoid hats and head coverings of any kind to avoid overheating. Hats and head coverings have been found to increase the risk of sleep-related deaths. Additionally, hats and head coverings can become dislodged and slip down over the baby’s face and nose and create a suffocation risk. They should always be avoided in the home setting. 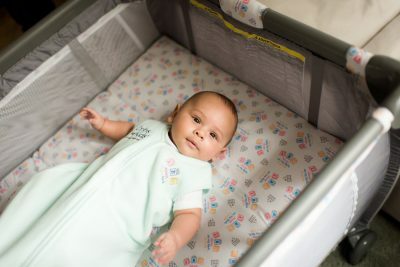 After reading the safe sleep guidelines, many parents know not to put blankets into their child’s cribs to avoid suffocation and strangulation. However, blankets are also linked to overheating deaths because parents put on too many trying their best to make sure the baby is kept warm throughout the night. Bulky, heavy sweaters or coats (particularly snowsuits) are also not suitable for use for keeping your baby warm at night. Although these types of garments will not become loose in the sleep environment, they can easily cause the infant to become overheated as they are designed to retain body heat under outdoor, not indoor, temperature conditions. What can I do to keep my baby warm? If you can’t use regular blankets or use hats to keep your baby warm, what can you do? The American Academy of Pediatrics suggests using the safest alternatives to blankets, wearable blankets, otherwise knowns as sleep sacks. Wearable blankets keep your baby safe because they greatly reduce the risk of suffocation and entrapment caused by regular blankets. Because of the way wearable blankets are designed, they cannot get wrapped around your baby’s head or neck. So, they keep your baby safe at night, while also keeping them warm. Additionally, you can be mindful of room temperature. The American Academy of Pediatrics cannot recommend an exact room temperature due to varying research results. However, we still tell parents to set their baby’s room temperature between 68 and 72 degrees (F) as a common sense practice. 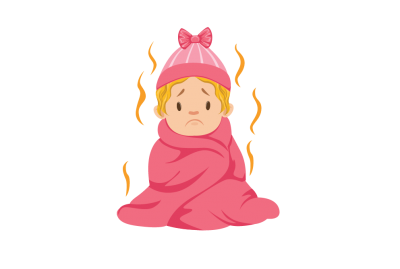 We feel that at this temperature range, parents and caregivers will not feel the need to put on too many layers of clothing or coverings and will be content using lightweight clothing or sleep sacks.